Digital pH Meter has LCD readout. Portable Model 25-30 pH meter has resolution of 0.01 pH over full 0-14 pH range, 0-1400 mV recorder output, independent slope and buffer controls, and manual temperature compensation from 0-100Â°C. 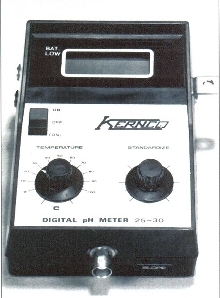 Kernco Instruments Co., Inc. is pleased to introduce its new Model 25-30 Digital pH Meter, AC/DC operation with LCD readout. The Model 25-30 portable pH meter features resolution of 0.01 pH over full 0-14 pH range, includes 0-1400 mV recorder output. 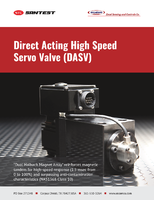 Model 25-30 also features independent slope and buffer controls, plus manual temperature compensation from 0-100°C. Meter has liquid crystal display.